The memories of my first born’s birth day come flooding back to me and it’s almost as if I’m transported back in time, thirty-one years ago on the 1st of September. I don’t even have to close my eyes; I can see myself going through the entire twenty-hour birth process with as much acuity as a high-definition movie. What is triggering this flood of memories….? The wait for the birth of the royal baby who will be third in line to become head of the British monarchy…the future King or Queen of England has just ended. It’s an 8 lb. 6 oz. bundle of BOY! (well, second really, having miscarried my first child) and I was due to deliver just a few months later. I still recall the image of Charles and young Diana, holding newborn William wrapped in a simple white blanket as they left the hospital. I can even remember telling my mother that I wanted to get a white blanket just like William’s. Yes, by golly….to this twenty-four year old mother-to-be it was important! I wanted to look as beautiful as Diana; I was going to exit that drab Army hospital carrying my baby (didn’t know the gender) with my baby wrapped in a white blanket and I was going to wear a pretty dress and look as close to polished and elegant as Princess Diana. hough I had helped take care of my baby sister upon her arrival in this world when I was ten years old, all of a sudden I hadn’t a clue what to do! The first diaper-changing at home, on my own, had my heart beating out of my chest in fear and apprehension. I was not only a wreck, I was an all thumbs petrified mess. Here was this tiny, screaming being on the changing table; Beads of sweat on my forehead…would I stick my baby with the diaper pin and scar him for life? (yep, didn’t go the Pamper’s route until he was about two months old at which point I said to hell with the tree-huggers… I need ease and convenience…and besides, it was my finger that I kept sticking with the diaper pin!). I was so overwhelmed with the constant fear of my baby falling off the changing table If I even blinked for a nano-second that I stopped using it, opting for the floor instead. What a waste of money that piece of furniture was! If I didn’t support his tiny neck just right would I physically damage him somehow….would he break? And don’t even get me started on the whole breast-feeding thing! Let’s just say that when baby cried for his feeding, mommy did too…that was how painful it was. I was totally consumed, 24-7, with thoughts of my baby…literally, a thousand thoughts and questions swirling every moment of the day…even though I had read the pregnancy guide-book “What to Expect When You’re Expecting” and had done a fair amount of the recommended reading on baby milestones from birth to a year. Books and videos just weren’t the same as being faced with the real, hands-on, in-the-moment, squirming, crying infant experience. Sure, my husband at the time was a “pro” having had the experience of two children during his first marriage but he was gone a lot due to work. And, unfortunately my mother just didn’t have the nurturing gene to be of much help to me though she was pretty good with dispensing a plethora of advice that was probably more applicable in the middle ages. Still, I muddled through it all…as so many first time mothers do, but not without a good deal of constant worry and self-criticism. My baby thrived despite all the trails and tribulations…and his mother’s self-doubt (though, thirty-one years later, he is mess of a young man but it certainly wasn’t because of his baby years I can tell you that! Stories for another time I suppose). I think about Kate and her new little prince now and I imagine there must be a degree of the same new-mother angst, even if the nanny does all the nappy changing. She is sure to have a cadre of family and professionals to help her through those first few days and weeks following her son’s birth. The new Prince of Cambridge will enjoy a lifetime of privilege and with it a legacy of historical burden too. It’s a terrible shame his grandmother, the late Princess Diana, is not here to be a part of this new life but still, this baby’s life is surely off to a wonderful start with the love and support of Princess Diana’s first born son William as his father (made ever so much sweeter due to Princess Diana’s genuinely warm and affectionate legacy) and the lovely and level-headed Kate as his mother. 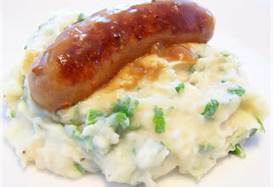 Cheers and God bless to the royal family and to celebrate the occasion on this side of the Atlantic….it’s Bangers and Mash (perfect British pub food) for dinner tonight. This is surely a wonderful expression of how great a mother you are. You need to save this for when your son ever becomes a caring person. You express so much love and care. You show your real feelings. Great writing, my love.